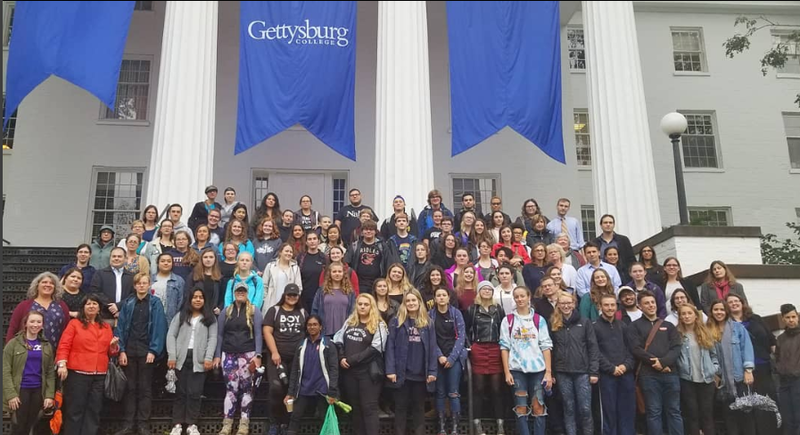 Gettysburgians Walk Out In Support of Ford, Ramirez | The Gettysburgian. On Monday, Sept. 24, members of the Gettysburg College community joined together shortly after 1:00 p.m. in front of Pennsylvania Hall to take part in “#BelieveSurvivors National Walkout and Moment of Solidarity” in support of Dr. Christine Blasey Ford and Deborah Ramirez, each of whom has recently come forward accusing Supreme Court nominee Brett Kavanaugh of sexual assault. The national walk-out was co-hosted by many organizations political and nonprofit organizations, including the Progressive Turnout Project and the Women’s March. About 80 members of community posed for a picture, many dressed in black, joining the images around the country from concurrent satellite walkouts.